Just a moment ago, I was browsing through my facebook page, scrolling down the page as usual. Sharply, I had to make a long pause seeing one of my teacher's post which read: If You Ate Today...Thank A Farmer. It really made me to cogitate about this seven words, wisdom-loaded sentence, in which if every one of understands the bare bones of characterless farmer, then I am pretty sure that every one of us will have at least something to say. Everyday zillions of tonne of rice are consumed, trillions of long ton of vegetables are digested and billions of short ton of fruits are devoured across the world for the constant survival. Do we ever take time, just a moment to realise the ultimate source of everything those fill our hunger and quench our thrist for our living? Do we really think how those stuffs have come right infront of us to serve us? Do we absolutely love to study about their life stories? Or you are just okay with your finally-fully-filled belly and a real belly laugh. Don't say it is your money because you already knew that your big money cannot be eaten. If you ate today, thank those face-saving farmers because it's only due their consistent effort and persistent hard work that we are able to live everyday through the money we earn. We need to appreciate for the rice we consume for they have been in scorching sun for longevity. We need to owe them for the fresh vegetables we digest for they have been in driving rain for ages. We need to value them for the green fruits we devour for they have been bathing in unbearable blisters for eternity. This world would have been poorer if farmers have left for heaven. Let's imagine, at one time, one lily white day comes for farmers in which they are being invited by god for a decade visit as a sign of appreciation for their contribution for the survival of human race. All of them have merrily journeyed and are happily gone. Now, there is no farmer. There are only doctors, engineers, teachers, architectures and everybody is busy doing its own job. The time keeps elapsing and so is life. From first year to fifth year, it will be as usual because everybody can use their money to buy for their needs from the shops which are supplied by farmers and the shop too will have plenty of recently supplied products. By the end of seventh year, the real wonder will come, because one day, a doctor will be visiting his preferable shop which supplys him with his favourite vegetable, globe artichoke. The salesman will convince him about its exhaustion with the explanation of farmers who have left for heaven. Then the doctor will wonder about it and will be fine taking cabbage. Next day, the engineer will be visiting her preferred bakery to buy her yummy bread. Unfortunately, the baker will feel sorry for her due to shortage of flour which has run into completion due to no suppliers. Suppliers, afterall those farmers. She will return home with several fairy cakes. Next time, teacher will be visiting her florist for she always love flowers. Again like others, her visit will be all in a vain due to shortage of suppliers(farmers). Now, it will be artichitecture's turn. Due to his busy design, he will have forgotten to buy rice for his next meal. So he will visit his everyday shop and ask the shopkeeper. The shopkeeper will remind him not to visit him next time as he would not be selling due to shortage of suppliers. The architecture will be wondering and harbouring over this. By the end of eight year, all of them will be running into exhaustion and they will visit each and every shop to get their needs. Every shopkeeper's reply will be same: Sorry, we have been running into shortage of everything, very recently due to absence of suppliers and now we have made with our minds not to sell because we need to eat, we need for ourselves. One day, every need will get into exhaustion. At one time, leaving all their work behind, they will have meeting and engagement in the discussion of shortage of their needs. The teachers, doctors, engineers and architectures will say that they have been depending shopkeepers for their needs and the shopkeepers will say that they have been supplied products by farmers. But the farmers have gone to heaven. Now all of them will realise the farmers have been the ultimate source of their needs and their big money cannot be eaten. They will pray for the farmers' return. So that's why today you will see farmers supplying us. Do you really think the world is going to survive the very next moment. To work we need to live, to live we need to eat and to eat we need food, and the food producers are farmers. They dig the earth wholeheartedly, sow the seeds zealously, guard the crops gingerly and finally, their products are shown majestically to the world. Timely, their majestic harvest are being scattered to the length and breadth of the world and luckly reach infront of you, right now, for your breakfast, lunch and dinner. So you happily, hungrily eat all without thanking those, who brought for you. Take time to realise and life to appreciate them. As quoth by Martin Luther King, "No work is insignificant. All labour that uplifts humanity has dignity and importance and should be undertaken with painstaking excellence," no matter what we are doing, as long as we contribute for the humanity, that will be the greatest thing we will ever cherish. Besides, this will be the most counted one. My final chief point here is; Thank far-sighted Farmers, and appreciate them. They have been farmers not only for themselves but for all of us, for all of us who eat everyday and enjoy living life to the fullest. We never know the difficult farming equations they solve and the obstacles they face. We have never experienced the adversities they do. Farmer is a soul that drives this world. We are today, what they have been doing. 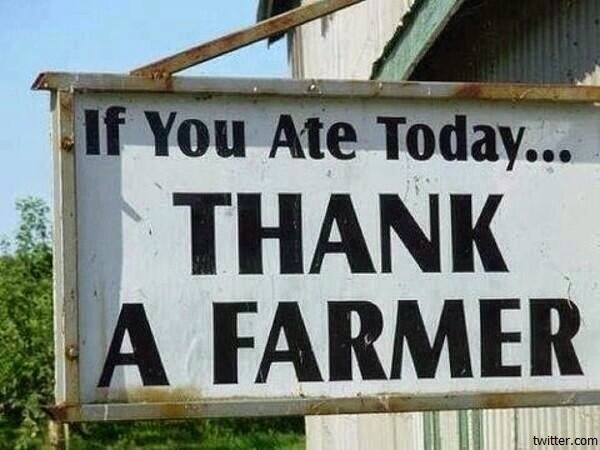 If You Ate Today...Thank A Farmer.